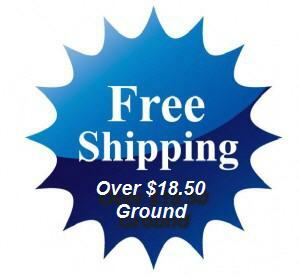 Free Ground shipping offer is Cont USA only. • A 20%-45% non- refundable fee on any orders already shipped. No refund can be given on special ordered products. • Returns are @ the option of our store and are subject to the 20%-45% depending on manufacturer restocking fee. Customer must pay for insurance and delivery confirmation back to us. Some items cannot be returned as these are directly shipped from one of our partners. • Every account insured against unauthorized transactions up to $100,000 if using paypal through paypal services. We do not charge your credit card but paypal a 3rd party owned by ebay does all of the creditcard verification process. They are our payment gateway who processes all credit card transactions. They then in turn fwd the $ to our account. By agreeing to the terms you agree that you understand this. • Shipping and handling is an estimate, We will contact you if it is different and will not charge you until authorized. •Orders are shipped to the address you provide on our on-line order form. You should receive an automated order number and confirmation with the information you provided. Be sure to double check all information. •We do not accept Phone in ordering. • Should you find it necessary to return a product to us, please contact us within 30 days of your original invoice date for a Return Authorization Number (RMA) prior to shipping the item back. Shipping and insurance fees are not refundable. Returned products must include all original boxes with original seal and paperwork to receive a refund or replacement. All returns must be properly packaged and insured to avoid damage. Please mark the RMA number clearly on the shipping label and shipping box. Please do not mark on the product box. Refunds cannot be issued for improperly packaged returned items. All RMA's are valid for 10 days. Any items returned without a RMA number will be refused. We are unable to accept for return any product received after the expiration of the RMA. RMA's cannot be extended or re-issued. We reserve the right to refuse any item. The Mandatory Restocking fees will apply for all returns to cover box costs, packing materials, and man hours it takes to pack, inventory, and inspect these items. Any Drop shipped or special order items are not allowed to be returned. To price match the items the request must be made prior to paying for your order. Please call or email us and we will let you know how you can do this on line as if you make a payment on-line many times we cannot refund the difference. We do not back date price matched items from orders. Price matching is a benefit not a right and is determined by the store. We will only price match in stock items by authorized dealers. • If your merchandise arrives damaged, please contact us within 24 hours of arrival. All damage claims must be filed with the carrier.. Please do not discard the damaged item or the packing material. The carrier may choose to pick up the damaged item for inspection. In this event, the carrier will contact you within 7 to 10 business days after the claim has been filed. Items returned due to customer error with wrong address or returned for other reason will be refunded in full minus a 20% restocking fee and the cost it cost us to ship the item to the customer. Tax Exempt. members must email a copy of exemption paperwork within 30 days or taxes will remain on the final bill.